On Saturday night Mrs BWM kindly offered to put Scarlett to bed, so I seized the chance to pop up to the wood. I jumped into my camouflage clothes, crammed a crust of bread and a piece of cheese into my pocket for supper, and headed off. Summer is marching on into autumn now. The wheat in the wheatfield has been harvested and the whole field harrowed over. Not only is it an absolute bugger to walk over until the footpath is trampled down, it means that the badgers have to look for other sources of food. At the top of the field there was a fresh badger latrine that showed that not only were they still marking out the field as territory, they are making use of other food resources. Now, it’s always been a principle of mine when badger watching to approach and leave the area of the sett as quietly as possible. You never know when the badgers will be around, and even if the badgers are not in the vicinity you can still scare them by setting off a ‘chain reaction’ by scaring other animals – you approach noisily, you frighten a deer, the deer bolts past the sett and frightens the badgers. My stealthy approach to the main sett is made easier by a large fallen ash tree (ash trees seem to have a habit of falling down – remind me never to camp under one). I can walk along the trunk silently rather than rustling through the undergrowth. On this evening, halfway along the trunk, I caught sight of a deer in the direction of the sett. This is exactly the situation I mentioned above, and it calls for extreme caution. But it got worse. As I froze in my tracks, I noticed movement in the undergrowth at the far end of the tree. It was the badger cub from two weeks ago – out of the sett early and foraging further afield. There was nothing I could do but remain motionless and pretend to be a tree. Badgers are a bit like T-Rex – they can’t see you if you don’t move (mostly). Of course, staying still while perched on a fallen tree trunk is easier said than done, but the badger didn’t notice me. When it moved out of sight I took my chance and very slowly sat down. For the next 40 minutes I sat on my fallen tree as the badger snuffled around within 20 feet of so of me. The light was bad in the middle of the wood so none of my pictures worked, but I took a short video (video works better in low light on my camera). It isn’t great quality, and it doesn’t shed any light on badger behaviour, but it will remind me of a fascinating evening watching a badger foraging at close quarters. The badger came closer and closer but still didn’t seem to be aware of me. At one point it was only six feet or so away from me as it crawled under the tree I was sitting on. It wasn’t what I planned for the evening, but a memorable encounter just the same. The badger was clearly foraging, but I couldn’t make out what it was feeding on. I could hear loud cracking, crunching noises every now and then, as if it was chewing on dry sticks. This was puzzling. It was louder than the noise of a snail shell breaking, but I couldn’t figure out what it was. When the badger had moved off I eased my cramped legs off the tree and went for a look. The tree overhead was a hazel, and spread around the area were broken hazelnut shells. Now, I can’t prove that this is what the badger was crunching on, but it seems likely. A badger’s jaws are certainly strong enough, and hazelnuts are nutritious. There are references in the literature to badgers eating hazelnuts (in 1935!) 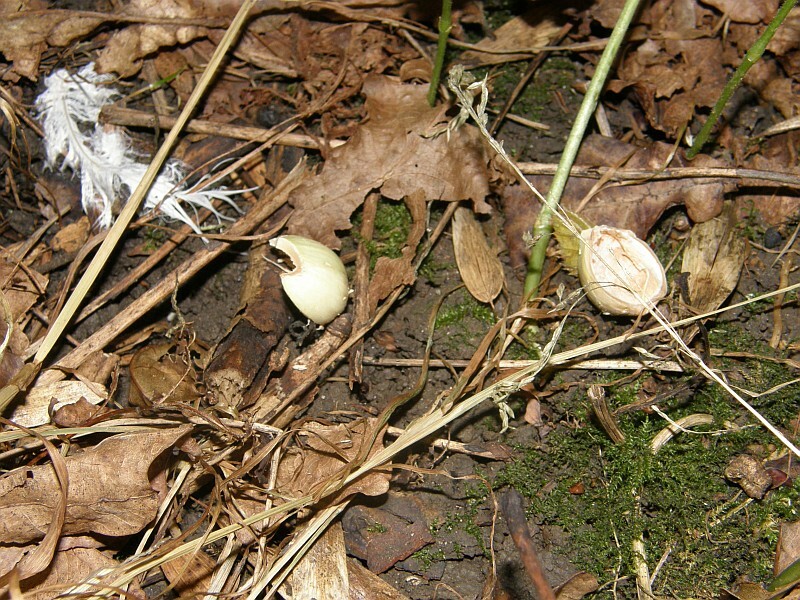 However, the shells could have been there before the badger came – squirrels crack hazelnuts and they’re plentiful in the area. I tried to find evidence that the badger was responsible – a shell with fresh badger spit on it, for instance, but there was nothing definite. All in all, a fascinating evening and one that provoked all sorts of thoughts about badgers’ diet. I can’t prove the badger was eating hazelnuts but there’s no reason why not. What with the sloes and the nut shells I can see some sort of badger dung analysis project to keep me active through the autumn. This is what I like about badgers. Even though they’re a common species, living side by side with humans, there is still a chance to add something, however small, to what we know about them. Just don’t tell Mrs BWM. A fascinating post – as ever! How could you sit still for so long? but I’m glad you did. So very interesting! Actually, the time went very quickly. It was good to just sit and watch. I have been poking around in the badgers poo over the last few weeks hehe, a few weeks ago they were really squidgy and full of laurel fruit stones (the woods is riddled with the stuff!) and then this last week they have gone really hard again looking more like large dog poo – not had time to poke around in these lol! I also had that happen to me ages ago when I approached the sett a cub was already out and I had the freeze in the most ridiculous position but slowly managed to turn and sit without it noticing! Hi Ele – good to hear from you! Good to hear that other people are interested in badger poo too. Interesting about the laurel stones. I haven’t seen any latrines with obvious fruit stones lately, but I will take samples next time. It sounds like an interesting course you’re on. I’d love the chance to spend time with wildlife on an official basis, so I’m a little jealous. Well done for getting shots of the badgers mating too. I understand it’s still a relatively unknown area. And the otter is really special. I am definitely jealous of that. One day, I hope to see one myself, but it’s just an ambition at the moment. Thanks for the comment – I look forward to hearing more! Thanks, the course is great and am doing lots of voluntary work too. 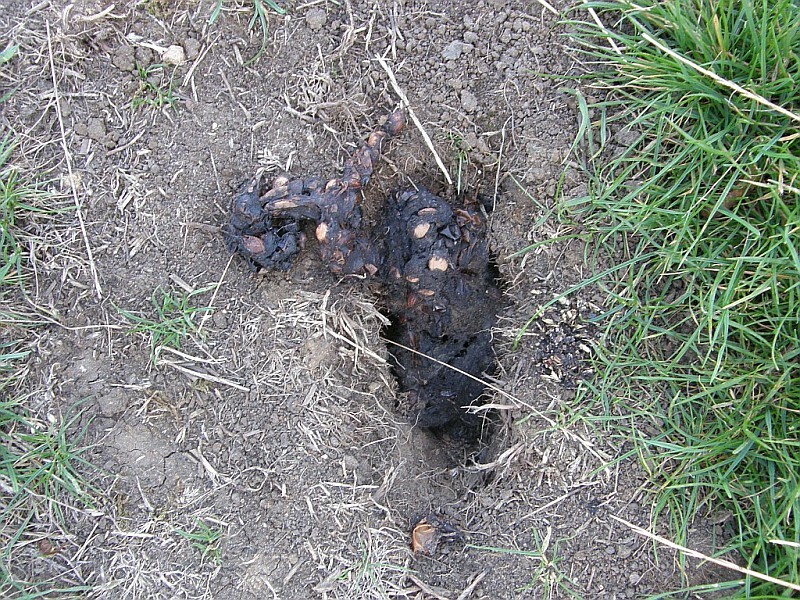 The other day I did Otter Survey training and we found some Otter poo with fish eggs in 🙂 Fascinating stuff. At college in the new year we will start lab work which will be very interesting. I’d like to start up a blog like yours but not sure I can find time at the moment. Maybe I will give it a go over the Christmas holiday. Sounds fascinating Ele. We’ve got otters down the road from me on the River Flit, and I would dearly love to get a glimpse of one. But you’re right. Time is always the issue. I just don’t have the hours available to put in the time necessary to get to know the area and stake out likely sites for long enough. As for the blog, I’d say just do it. This is predominantly my diary. It’s very nice when kind folks like you read it, but its main purpose is a record of the various things I’ve done and seen. None of them are particularly groundbreaking in themselves, but it is nice to be able to look back and see patterns and check facts. I look forward to reading of your exploits…! I’ve been finding similar stones in badger pooh for the last couple of weeks and racking my brains as to what they are. There aren’t really any obvious fruiting at the moment. Any ideas?